Note: This is a learning exercise for me so if you feel I’ve missed something or made a wrong decision then please write it in the comments and I’m more than happy (it was one of the main reasons I’m looking to do this series of postings) to discuss and I’ll amend the design accordingly if it makes sense and hopefully I along with other people reading these postings will learn from it and become better. Q: Is there any capability of utilising the existing storage in the privately owned UK DC? Q: Is there no way a minimal planned outage/downtime can be organised for the migration of the workloads due to the likely higher cost of equipment to ensure this near-zero downtime? Q: With the leasing out of the private level 4 suites in the future will there be a requirement to manage/host other companies processes and data within this infrastructure being designed? A: No there is currently no plan to do this due to security concerns and the number of compliancy regulations Safe and Legit need to maintain and fulfil. There is however a possibility of internal consumption and charging for usage of the DC’s resources to other departments. Q: What other questions do you feel should be asked? – Usage of the privately owned DC’s physical infrastructure for the consolidation of all three UK DC’s. – All required upstream dependencies will be present during the implementation phase. – All VLANs and subnets required will be configured before implementation. – Safe and Legit have the existing internal skillset to support the physical and virtual infrastructure being deployed. Design Choice -EMC PowerPath/VE multipathing plug-in (MPP) will be used. -EMC PowerPath/VE leverages the vSphere Pluggable Storage Architecture (PSA), providing performance and load-balancing benefits over the VMware native multipathing plug-in (NMP). Design Impacts -Requires additional cost for PowerPath licenses. -VMFS is a clustered file system specifically engineered for storing virtual machines. -Single-initiator zoning will be used. Each host will have two paths to the storage ports across separate fabrics. -LUNs will be masked consistently across all hosts in a cluster. a variable rate of change. Well that’s my attempt at the storage design portion of Safe and Legit. Hopefully people will agree with most of the decisions I’ve made if not all of them and I have to admit it took me most of my Sunday just to do this piece and think of all the impacts and as stated there may be additional constraints and risks further down the line. Categories: VCDX, Virtualisation | Tags: design, Safe and Legit, SDRS, Storage IO Control, VCAP-DCD, VCAP5-DCD, VCDX, VMware | Permalink. this exercise is indeed a good way to train. – I think the main design choice is missing : how will you explain that you choose FC against NFS ? – what about the RAID level of the datastores ? > 830 GB * 500 disks : around 415TB raw and you need to add spare disk, RAID parity, no ? – you don’t have latency / IOPS requirements ? Maybe they are missing from the VM assessment ? Hi Gregg, great series of articles, keep them coming! I don’t know how many clusters you will create in your design, but with so many LUNs I would add as a constraint regarding vSphere 5.1 storage maxmums of 1024 paths and 256 LUN’s. EMC VNX 5700 is not active active array. It is active passive array. The VNX 5700 is ALUA to be exact which isn’t true active/active that’s true. Out of interest what would you recommend then? this is a very interesting way to discuss some design ideas. First: I think this question of 400LUN’s should be reviewed because of the limitation of 256 LUN’s in vSphere 5.0, as already said Didier Pironet. One thing that can help reduce the amount of LUN’s needed is the disk type that will be used at storage (SSD, SAS, SATA), maybe the three will be, and also the type of RAID, which can help achieve a consolidation ratio of VM’s/datastore greater. I think this option for 15 VMs / LUN is a bit old, today you can get better rates. It is also important to think in the future if you use all 256 LUN’s at once, you will have nowhere to grow. second: in an environment with so many LUN’s and consequently many datastores, I would not use THIN disks, even more that don’t already mention what management tools you will use. Without a good tool it is very difficult to monitor the use of thin disks in so many datastores. Thanks for this opened discussion. i sure that all readers will learn a lot with this post series. – Yep there is the limitation as Didier mentioned and as i stated i did have a certain number of hosts per cluster in mind for the host design but looking at the type of disk is an option of how to get more vm’s onto the storage. It was a hard one as I never defined their IOPS/Latency requirements which I might try define so that I can do the disk design better. – the 15 VM’s per LUN average was just down to space requirements compared to amount of storage and if you feel thin is a bad idea then the storage will be massively filled which from experience will then bring in the constraint of costs. The monitoring of thin isn’t too difficult and true i didn’t stipulate the exact alarms I would create but setting alarms is a very standard practice for the provisioning of storage via the thin method. First off thanks for all the info you have here compiled for the DCD, it’s really been a tremendous resource. Here are a few of my thoughts in addition to what everyone else has posted. It ended up being a lot longer than I thought, but I’m attempting the exam tomorrow so a lot of stuff is already flowing through my brain. Also, this was really a great exercise for me to go through and start putting pieces together, so thanks again for that! – What kind of array do they currently have, specifically Clariion or Symmetrix? This would be a major factor because there are restrictions on LUN migrations between systems that you may run into. I know Clariion->VNX works and DMX->VMAX works, but going DMX->VNX or Clariion->VMAX I’m pretty sure have restrictions. – I also believe some of the tools and commands are different between the different array families, so factoring this into the design to overlap with the existing knowledge of the storage staff would be important. Admittedly there will be new things to learn anyways because of the new generation of SAN, but the curve may be significantly different. – The constraints mention EMC and Cisco as the brands, but considering it doesn’t sound like any of their environment is currently virtualized and the primary use case for UCS has been for virtualization, I doubt they would actually have UCS servers, so it should be added to the questions for the customer (I also doubt they have 13,000 physical UCS blades), so getting info on rack vs blade would be important. – Based on the above I’ll make the assumption that they currently don’t have UCS servers but want to make the migration towards them as part of the scope of this project because no other server vendor was mentioned from what I saw. Determining if they want to use blade or rack mount servers is important because one will pose additional constraints on the environment (blades) whereas the other one won’t (rack mount). From a hardware standpoint the rack servers would let you use any PCIe device you want, so you don’t have to worry about them. The blade servers though need to factor in that whether you like it or not, you’re a proud new adopter of FCoE. If Microsoft clustering is used that requires the VMs to access an RDM, VMware ONLY supports FCoE when using the Cisco VIC cards going to a Cisco UCS chassis from what I’ve read, so you’ll have to add this to your list of constraints. – Based on the above, if the customer decides to go with Cisco UCS blade servers this does introduce more options for the storage to consider, specifically between FC and FCoE connectivity to the new SAN. I know the latest FlexPod reference architecture with NetApp recommends using FCoE adapters out of a NetApp array, so looking into this on EMC would be something to research. – I think this is something that should have more consideration behind, especially when it comes to whether or not different applications will have different performance requirements. While storage tiering is great, there will still be times where cold data needs to be accessed and factoring this into what kinds of disks/RAID groups sit behind the flash tier would still be important. The VNX5700 supports up to 1500GB of FAST Cache which would give you a 400:1.5 ratio of SSD vs HDD, AND eat up 30 of the available 500 slots (https://community.emc.com/docs/DOC-11313). Based on this, going with a bigger SAN and/or multiple SANs may be something to consider. * The below comments are more related to the migration process of P2Ving the servers, and not really part of the final picture. 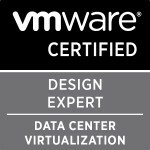 – Up until recently one thing to consider here would be whether or not RDMs were needed as part of the migration process because of limitations in VMware Converter with regards to GPT disks, where I needed to actually attach a LUN to a VM as a vRDM and then do a storage vMotion on the vRDM to convert it into a VMDK. – I’ve only done this with the one VM before so don’t quote me on risks and scale, but this method could possibly be factored in during the migration if converting the LUNs attached to the physical servers would lead to an unacceptable maintenance window. P2V’ing just the OS volumes and then attaching the data volumes as vRDMs to do the migration may be an option. – Based on the desire to move to a shared/distributed model, many of the applications may not need SRM, and of those that do you’d want to factor the limitation of being unable to use SIOC/SDRS into the LUN design, but I don’t expect FAST to address all of the issues, because it won’t have the per-VM insight available that SIOC has. I mostly just imagine this will be a much more complicated decision and that more questions about the application requirements and behaviors should be asked.